The goal for today’s seller is to provide buyers with a complete brand experience, regardless of channel. Omni-channel success is about strategic decision making, having the right decision support and logistical capability to invest in the customer while you have their attention. That’s why creating a seamless omni-channel experience is key whether shoppers buy online (via mobile, desktop, or tablet), in-store, or any other channel. As a retailer, you must keep up with customer’s evolving expectations. Failure to do so will result in lost sales, lower lifetime value for customers, and a diminished social presence. 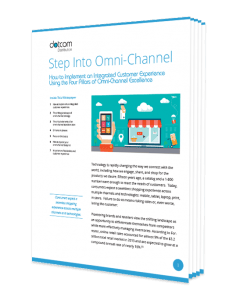 This white paper provides a roadmap to omni-channel excellence. Fill out the form below to get your free copy now.